It has been questioned whether sales incentive schemes are necessary in business. Alfie Kohn famously said in the early 1990s that sales incentive schemes are doomed to fail because they encourage perverse short-termism that conflicts with long-term success. Yet, sales incentive schemes, rewards, and bonuses remain a huge part of many organizations despite there regularly being high-profile stories of attempted clawbacks and lawsuits when past actions of employees led to long-term issues within businesses. Salespeople themselves are one of the most fluid types of worker, with 68% of them looking for new jobs at any given time. Looking beyond headlines of transiency, this statistic may suggest that this is apparent because the best aren't rewarded properly and the strugglers aren't given better assistance. The company, which sold products B2B, introduced a new scheme that rewarded its salespeople for volume of products sold. The scheme was a failure. While revenue did increase during it, the company's profitability turned negative. EBITDA projections swung by €1 million, to a €200,000 deficit. The linear nature of the reward meant that price became irrelevant in the eyes of the sales department, and thus products were sold at a discount. The product department itself had no incentive scheme, so were largely ambivalent to pricing requests from the more eager salespeople. In the case of the company, correctly introducing a margin-based incentive scheme for the product department ensured that there was the correct "creative friction" between sales and product. I recommend implementing percentage-based incentives across the three layers of the company, as mentioned above: individual, departmental, and company-wide. On a company-wide level, a simple metric such as profitability on its own can be a poor measure. For example, operational teams without revenue generating mechanisms can struggle to encourage such "positive" behavior (beyond cost cutting) because it's far removed from normal daily work. Soft skills are underrated as a performance measure, with programs such as 360-degree feedback being popular nowadays. To increase effectiveness of these, I recommend normalizing the grades and increasing tracking frequency to mitigate them being gamed. Don't be afraid to introduce rewards that don't have a monetary component for short-term initiatives such as a product launch, so long as the reward (for example: "Employee of the Week") is suitably heralded and given sincere gratitude for internally. In a classic written by Alfie Kohn at HBR back in the 1990s, it was proclaimed that sales incentive schemes, such as bonuses and commissions, cannot succeed in the workplace, with the thought process being that they merely change behavior in the short term and create an attitude where the main goal is to get the reward, as opposed to a long-lasting commitment to sustainable results. While I generally hold this to be true, I do believe and will demonstrate through this article that the redundancy of sales incentive schemes is a statement that cannot be taken at face value. Like most things in life, the situation is never as black or white as it seems. The fact that the corporate world doesn’t heed Kohn’s advice means that incentive programs do drive value in some organizations, and for that, my interest in the subject is to look at how to continually tweak and improve such initiatives. Throughout my career, I have witnessed the power that sales incentive programs can have on accelerating growth in a business. A running example throughout this article will be from my experiences at a business in Croatia, where an instance of a poorly structured scheme and its subsequent revaluation provided me with the genesis for this article. At any given time, 68% of salespeople are looking for a new job, which in itself demonstrates the need to reward salespeople, either to encourage the best ones to stay or for lowering the chances of failure for others. However, there was a catch. When assigning this measure to the salesforce, nothing was assigned as a performance measure to the product department that was in charge of setting the actual prices. Incidentally, this was the department that controlled another part of the equation: margins, and subsequently most of the profitability of the sales units. What transpired was that skillful salespeople managed to convince product department personnel to adjust prices as they saw fit. Although the product team was conscientious and did not necessarily change prices by default when requested, at many times they did so. The end result was that sales volume (and thus, revenue) skyrocketed after the initiative began in Week 9, but mostly as a consequence of a reduction in prices, which subsequently resulted in operating losses. The charts below show how the respective performance of sales and profits changed drastically. Because salespeople were the only team that had any tangible incentive, the rest of the company was in some cases oblivious, or agnostic, to these goals. This created an imbalance in performance with perverse behavioral changes, such as the salespeople who focused more on persuading the product team to adjust prices rather than the actual sales effort of persuading customers to buy products at regular prices. “Reality” hit my company rather soon when it realized that it was not making enough money from such high unit sales. Expenses crept higher, to the point that a cash crunch started to occur. 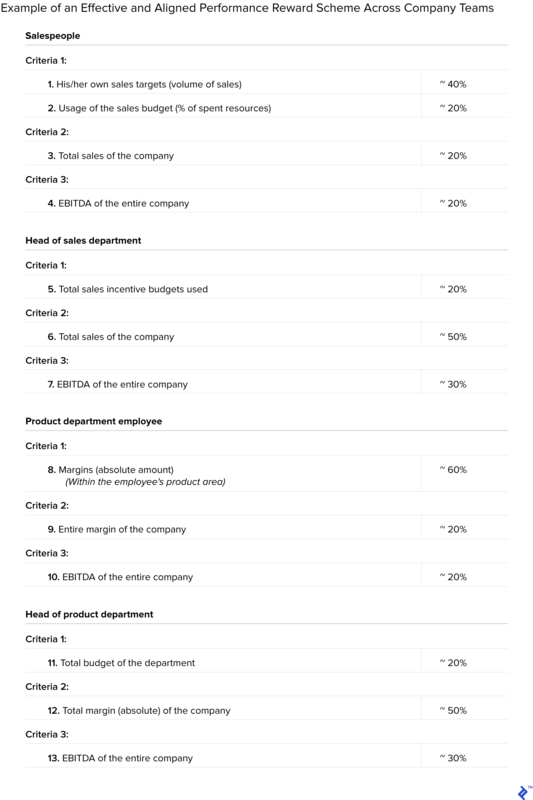 Management concluded that a measure that was strongly and exclusively tied to sales personnel (sales volume) was destructive to the value of the company (see the figure below) due to the simple fact that goals across the company were not holistic and aligned and also due to the overriding effect of a binary reward scheme. To fix the problem, management implemented margin as a performance measure for the product department, which served to quickly “put out the fire” that was causing losses. 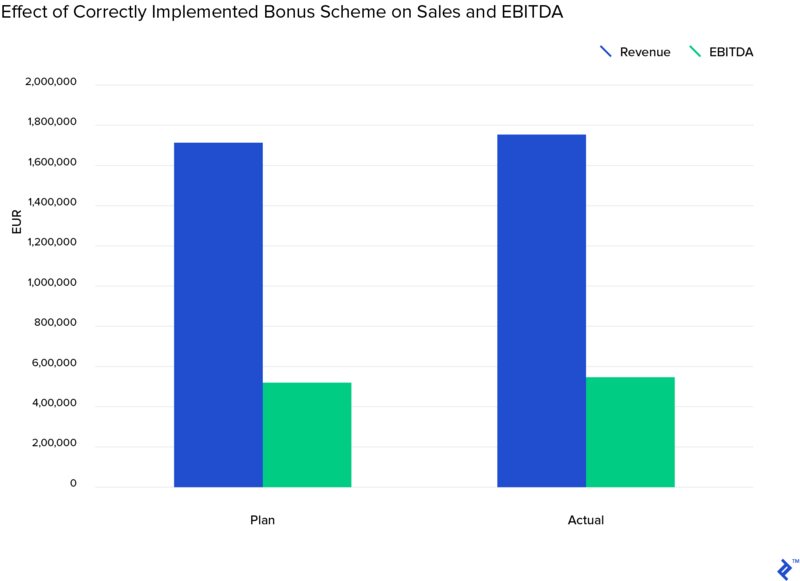 Product now had an incentive scheme, and they would not change prices unless they were sure that both sales volume and absolute margins would increase. 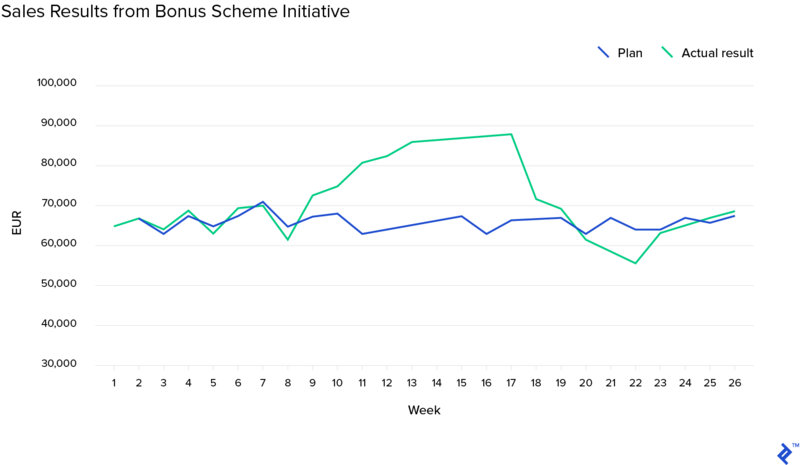 This made the entire incentive scheme more sophisticated and better. Sales and product could only work in unison and short-term tricks would only be a zero-sum game that neither side would want to cede on. 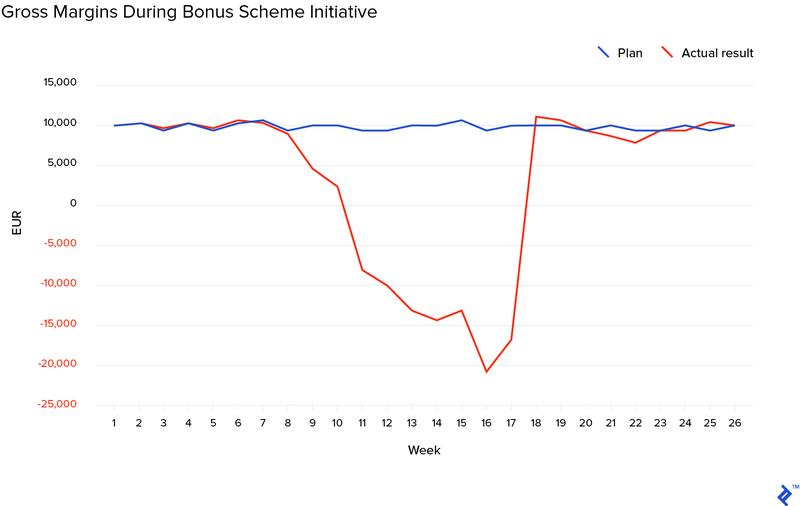 These two examples showed us that efforts to implement reward schemes in the organization are not simple and that they cannot be done sporadically. Instead, in order to be effective, schemes must take into consideration all of the financial parameters and be interconnected with all teams and departments within the company in order for them to be true value creators. Sometimes, even entities out of the company’s orbit have to be taken into consideration; for example, downstream suppliers and commercial partners. This approach is too simple and it won’t work due to the stark reality that not everyone understands what net profit of the entire corporation is and the parameters that affect it. For example, the sales personnel in my example could not comprehend and grasp the complexity of the product price and its effect on the bottom line. Of course, as I have already claimed, there is no such thing as “ideal” with rewards schemes. 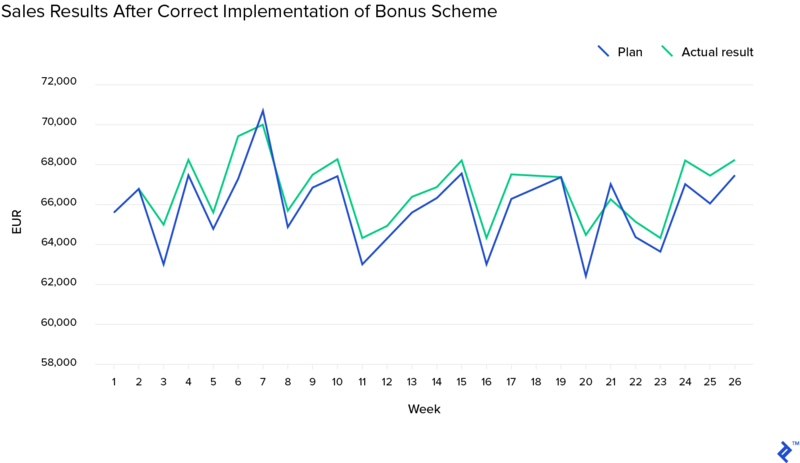 But there are types of incentive schemes that are better than others. I will show how certain principles can put measures in place that are understood by each relevant party, which funnel through to ensure that the bottom line of the company is correctly addressed by their work. A person executing certain tasks has to understand how the results of those tasks are valued within the wider context of the organization and how they are connected to its bonus scheme. The scheme also has to take into consideration what other people are doing (peers, other departments, and the entire company) and finally be tied to the company’s bottom line results (e.g., EBITDA, total sales, debt ratio etc.). Company results—company achievements, e.g., EBITDA, total sales, or debt ratio. A product department in charge of product procurement, purchasing and/or manufacturing, and setting the final market price. A sales department in charge of sales and its appropriate tools, e.g., marketing budget and other sales incentive schemes. We can further assume there is a team of a certain number of employees in each department and that each department is managed by a department head. Of course, this is a simplified version of a scheme in a simplified company. But it does include the principles I have stated above that are important in order for the entire team to push into the same direction. Now we can see that there will be enough employees to focus on sales, ensuring that the revenue side is maximized. On the other hand, there will be an entire team focused on ensuring that margins are in line, in addition to department heads that will be watching expenses. Furthermore, this system empowers everyone to be aware of the company’s overall goal and work toward it in unison. This is should always be the goal of management anyway, but with a financial incentive attached, it will ensure that this always remains front of mind to the employees. The result of such a scheme, implemented in the company (and scenario) that we are discussing, would most likely look like the representations in the charts below. Furthermore, in order to fine-tune the goals for certain employees and departments, we can use flexible percentages. In this way, we will ensure that the focus of certain employees can be more concentrated when appropriate. If desired, we could add many more parameters to increase the complexity of this scheme. The drawback of this is that it might be counterintuitive because increased complexity could be harder to comprehend for employees if there are too many hoops to jump through. But if we were to add one more parameter, it would be useful to add a factor to measure soft skills. As it is difficult to avoid subjectivity when trying to translate soft goals into hard numbers, there are several principles that should be observed in order to maximize the effectiveness of this. Only with such data can we have any kind of reduced subjectivity. Managers must encourage their subordinates to track their grades frequently and zealously. Regular sales incentive schemes, as we have discussed above, are usually set up for certain periods and are tracked in isolation. They tend to (and should) be tied to monthly, quarterly, and yearly reporting, perhaps even weekly too. But sometimes, and especially at certain levels of employee hierarchies, these periods can become too long and too predictable—at least, in the sense that some initiatives need to be conducted in a quick and short manner and there might not be an efficient way in the current incentive scheme to encourage it. While it can be dangerous to compose any incentive measure that is a short-term ploy—as it can affect long-term goals—it can also be beneficial if done right. It has to be rather simple, as the timing is key. Anything too complex will be difficult to communicate in an effective way. It has to be executed over a short period of time (if it needs to last longer, divide it into more short periods)—this so that if we see that it is having negative behavioral patterns (i.e., it has been set up wrong), it can be easily canceled. To be able to set up the right scheme, one must primarily be an expert in the field of human resources and/or finance. Setting up effective sales incentive schemes requires, first of all, extensive knowledge of the particular business that it is for. As each position within the company is rather unique and especially as we are all unique as individuals, we must take that fact into consideration and try to translate it into numbers in a way that reflects the reality on the company, staff interrelationships, and personal preferences. What is the meaning of sales incentive? A sales incentive is a compensation element that is paid to an employee on a variable basis in addition to their fixed salary. It generally is positively correlated to improved company performance, for example: revenue and/or profitability. How do you create a sales incentive plan? An effective sales incentive plan encourages performance that benefits the individual, the department, and the company as a whole. Correctly aligning these three goals together removes the potential for short-termist thinking and value-destructive actions. hello, good article, a comment on the third chart, the titles for the bars are inverted, regards.